Are you looking for a fun and unique gift idea for the special teacher in your life? A creative gift for coworkers, staff or school volunteers? These adorable drinkware gifts are personal, creative, unique and oh-so-cute! 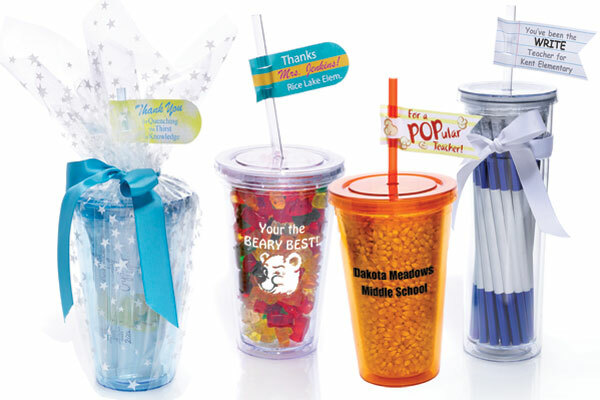 Using tumblers or mugs, you can fill them with a special treat, print out a cute tag and let your teacher know just how special he or she is to you. They’ll get a gift with a personal touch, a special treat and a mug or tumbler they can re-use. Get the kids involved in assembling these adorable gifts. They will take pride in presenting their teacher or school volunteers with something they created. Fill a spooner mug with a special treat. Chocolate candies or hot cocoa mix will be just the little bit of yumminess they’ll love! Choose from stock mugs, which have messages already printed on them, or customize your spooner mugs with your own message, mascot, school name, or whatever you like! Popcorn with a tag that says “For a POPular Teacher”. Print this sheet of tags for your mugs and tumblers. They’ll add a fun, creative touch to your gift. You can add names too if you like! Downladable tags.